Why this? Let me explain. The best simulation software is the one you have – run it and start learning. If you have no – buy P3D or FSX. I planned this course with those programs in mind. I use their components in exercises and tutorials. But this is not the only choice. If you prefer XPlane–use it. There will be differences in configuration (you have to deal with them on your own) and in sceneries, but I’m sure XP can handle this training. Even Aerofly FS 2 has the potential to be a training platform (at least at the basic level). I recommend against military simulators. Propeller fighters, equipped with powerful engines, handle nasty in inexperienced hands. Modern planes use automation to aid the pilot which helps during combat but kills learning experience. FSX sells on Steam (Steam Edition is the latest version of Flight Simulator X–improved and fixed). Priced at $24,99 often sells with a 50% discount. If you are ready to spend more, go for Prepar3D. Lockheed Martin acquired the source code of Microsoft ESP (commercial version of FSX) and refined it into a considerable better software in terms of visuals. For a cost of $59,99 or $199 (depending on license), you get software in 64-bit architecture (in the current version–P3Dv4) with tremendous improvements in performance. Even the $200 is not that high when matched with the cost of add-ons that users buy to improve their experience. If you are not sure whether flight simulation is for you–just wait for a sale of FSX:SE. Smooth simulation is essential to control your flight. On a less-then powerful PC, a slide-show-like appearance of the sim takes the fun away from flying. Besides, your ability to perform maneuvers decreases. With modern PC you should be fine as long as you use default sceneries or “light” add-ons. Still, cheap laptops intended for office use may require optimization. Therefore try keeping your frame rate above 20 (minimum). Aim for 30+. Visual quality will be your second priority. Airport details, for example taxiway signs and lights are vital. Furthermore, you need good reference points on the ground to train in navigation, so do not go too low on visuals in your settings. If performance is the issue–get rid of the traffic. To conclude this part–start with medium settings. If you have 30+ frames per second–increase them. With less than 30 keep the settings or lower them. How to check the frame rate? Take a peek at keyboard shortcuts that I mentioned later in this post. I hope the realism doesn’t frighten you–it’s better and in the long run, this speeds up the training. Keep realism settings at most realistic. Any help from the simulator may save you on day one but add to your training thereafter. Don’t waste your time. My realism options from P3D. FSX settings are similar. A short comment on my choice. I set flight model options to realistic. There is no use in simplifying the flight model and learning bad habits. Once you master P-factor and torque handling you can fly any add-on plane. Choosing “easy” means being surprised later. The following settings are critical! You will find it hard to follow next lessons without this configuration. Display indicated airspeed (selected). Enable auto mixture (off). Use Autorudder (off). I urge you to ignore the crashes. FSX and P3D sceneries may consist of objects that lead to crashes. Run into this and your journey ends. It happened to me when my wheels of the plane rolled over turf. I divide keyboard shortcuts into three groups: fundamental, practical and pointless–those I haven’t used in years. The following are the most important–you should write them down at least (and learn them later). I hate the default head movement shortcuts. Such an indispensable feature requires shortcuts that are easy to recall and comfortable to press. Change them to something effective. Choose arrows for side and vertical movements (you don’t require them for flight controls with a joystick). Use home & end to bring your head forward and back. List of default FSX keyboard shortcuts is available on my Google Drive. Shortcuts for Prepar3D are the same. “Can I use my pad”? “Is the keyboard ok for steering?”. “Mouse?”… I receive those questions regularly. The answer is “no!”. You may fly with those, but you will quickly get into a position where the precision control provided by the joystick is indispensable. Don’t waste your time on substitutes. Logitech Extreme 3D Pro is cheap at $26 and I can endorse it as it served me for several years. Assign Logitech’s four main buttons to elevator trim (up and down) and flaps (extend and retract incrementally). Trim buttons are the most used in the sim. Place them where your finger rests, in the same spot where they put electric trim on a real world plane. 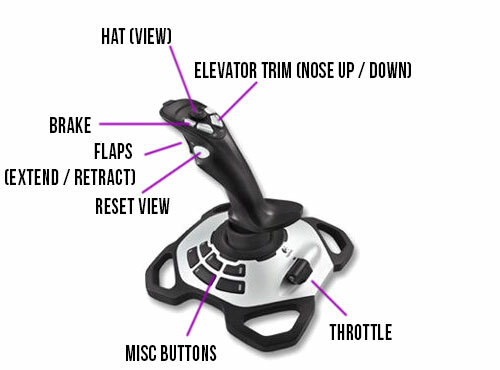 Place flaps on your joystick to reduce the workload on departure and approach. If you have two buttons to spare–use them for flaps. If your joystick has fewer buttons than Logitech–you can use F6 and F7 on the keyboard. The trigger engages brakes by default. Keep this setup. Make sure you can reset your view with a button–look around with the HAT and use button to focus back on what’s in front of you. This is how I assigned trim buttons. You may notice that I changed the default trim assignment for the keyboard and assigned joystick buttons no. 3 and 4. Start with something simple! “Land-O-Matic” name for tricycle gear on early Cessna has a good reason–it helps you land the plane and handles much better on the ground. Simple, piston engine with fixed pitch prop removes the need to care for the correct propeller speed. Use a slow plane to get more time for maneuvers. At this point, Cessna 172 is my plane of choice. You’ll find one in FSX by default. For P3D you require an add-on. Cessna 172 by Carenado is the cheaper choice, but the quality to price ratio is mediocre. Cessna 172 by A2A is the best on the market and even at twice the price of Carenado’s it’s worth every dollar you pay. With time I’ll add complex piston planes to my lessons. Later turboprops and jets will appear. But let’s stay with something basic. Consider parts of this text as “do and forget”. This is the case of choosing the sim, joystick and configuring both. Please, do note the keyboard shortcuts. I mentioned less than 30. A few are obvious, others you will learn sooner or later. You don’t have to memorize them at this point–just make a note (or print this part). Later, you will remember each of them. I discussed the best airplane for training earlier in “Which plane to choose?–Learn To Fly (#1)“. Consult FSX Help part of this blog for information on the configuration of your simulator.